Images from three of NASA's Great Observatories were combined to create this spectacular, multiwavelength view of the starburst galaxy M82. Optical light from stars (yellow-green/Hubble Space Telescope) shows the disk of a modest-sized, apparently normal galaxy. Another Hubble observation designed to image 10,000 degree Celsius hydrogen gas (orange) reveals a startlingly different picture of matter blasting out of the galaxy. 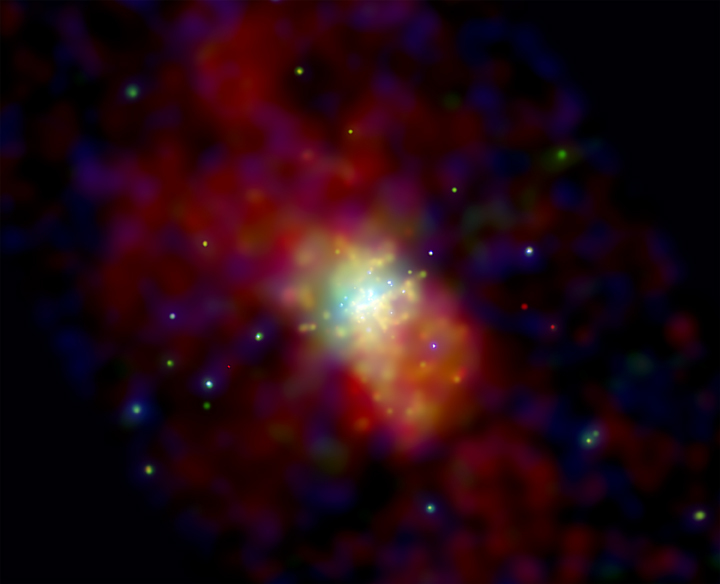 The Spitzer Space Telescope infrared image (red) shows that cool gas and dust are also being ejected. Chandra's X-ray image (blue) reveals gas that has been heated to millions of degrees by the violent outflow. The eruption can be traced back to the central regions of the galaxy where stars are forming at a furious rate, some 10 times faster than in the Milky Way Galaxy. Many of these newly formed stars are very massive and race through their evolution to explode as supernovas. Vigorous mass loss from these stars before they explode, and the heat generated by the supernovas drive the gas out of the galaxy at millions of miles per hour. It is thought that the expulsion of matter from a galaxy during bursts of star formation is one of the main ways of spreading elements like carbon and oxygen throughout the universe. 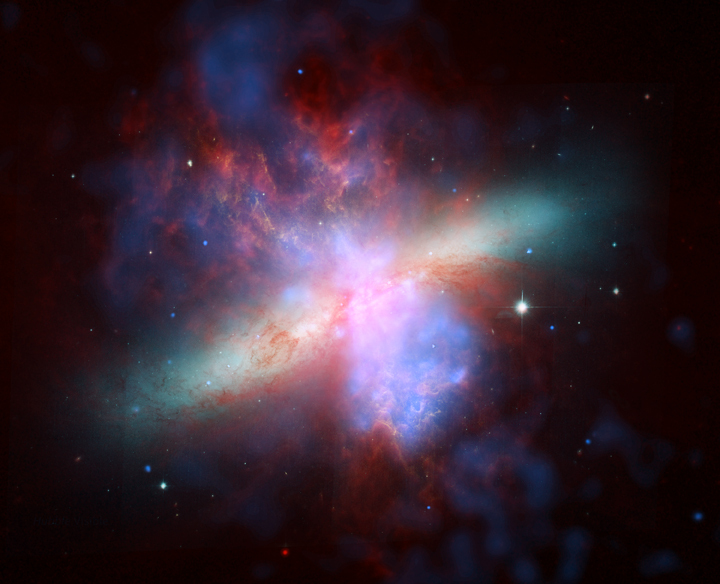 The burst of star formation in M82 is thought to have been initiated by shock waves generated in a close encounter with a large nearby galaxy, M81, about 100 million years ago. These shock waves triggered the collapse of giant clouds of dust and gas in M82. In another 100 million years or so, most of the gas and dust will have been used to form stars, or blown out of the galaxy, so the starburst will subside.